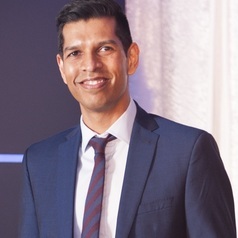 Nelesh Govender is a medical doctor with a specialist qualification in clinical microbiology and formal training in medical mycology and epidemiology. He heads the Centre for Healthcare-Associated Infections (HAIs), Antimicrobial Resistance (AMR) and Mycoses at the National Institute for Communicable Diseases (www.nicd.ac.za) in Johannesburg, South Africa. Dr Govender’s Centre includes the national reference laboratories for mycology and AMR and functions as a WHO Collaborating Centre for AMR. In this position, he works closely with the SA Department of Health to guide government policy. He is a member of the SA Ministerial Advisory Committee on AMR and current President of the Federation of Infectious Disease Societies of Southern Africa. He led the laboratory work culminating in discovery of a novel thermally-dimorphic fungal pathogen within a new genus, Emergomyces africanus. He led implementation and evaluation of a national cryptococcal disease screen-and-treat intervention; more than 250,000 persons were screened through this initiative in 2017. He was co-chair of the SA cryptococcal disease guideline panel, a member of the WHO cryptococcal disease and advanced HIV disease guideline development groups and is a coordinator/ contributor for ECMM guideline initiative. He is the principal investigator on two large implementation science projects funded by the US National Institutes of Health and Centers for Disease Control and Prevention. He is an Associate Professor at the University of the Witwatersrand and Hon. Associate Professor at the University of Cape Town.